This gallery of equipment images is designed to help you identify common types of rollers and compaction equipment, both past and present. 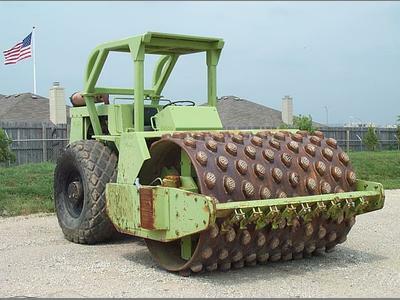 Self-propelled padfoot vibratory roller: c. 1973 Raygo 410A. The padfoot drum is used like a sheepsfoot roller to compact earth and rock fill. The pad feet are much shorter than a sheepsfoot’s spikes.